14.11.2017. The Georgians were producing and enjoying wine in the Caucasus as far back as the Neolithic period (6000-5800 BC), new research released today by PNAS reveals. These are the earliest tangible signs of viticulture and winemaking ever discovered, some 600-1,000 years older than the previous recorded discovery of Hajji Firuz Tepe, in the Zagros mountain region of Iran. The evidence was obtained by applying state-of-the-art technology to newly excavated materials from two sites in Georgia, with an international team led by Patrick McGovern, Scientific Director at Pennsylvania University, also known as the "Indiana Jones of ancient wine". Georgia, which borders the Black Sea and is situated at the foot of the Caucasus Mountains between Europe and Asia, is noted for its dynamic, traditional winemaking activity. The country attracts interest from wine lovers and professionals alike. 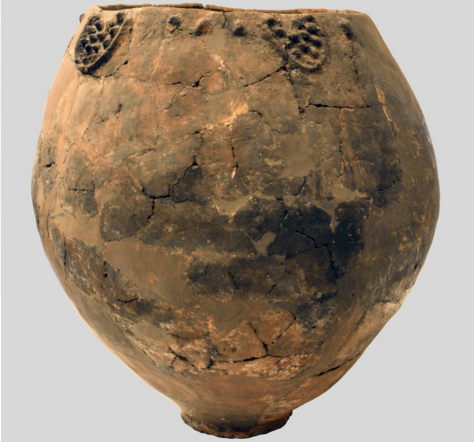 Today Georgia remains faithful to its ancient traditions of making wine in qvevri, large ceramic pots which are buried underground, creating distinctive 'amber' wines. UNESCO has included this unique traditional method in its Intangible Cultural Heritage (ICH) list. Most recently, Georgia's ancient wine culture was celebrated at Bordeaux's La Cité du Vin, a facility dedicated to the living heritage of wine, which hosted a special 'Georgia, cradle of viticulture' exhibition as its first "Guest Wine Region". Produced by the Georgian State, Georgian National Museum of Tbilisi and the Georgian Wine Association, it showcased 125 works of art and period photographs from the Georgian National Museum collections. The exhibition, which reveals Georgian mythology, folklore, art and dining traditions of which wine is a fundamental part, is likely to tour to other cities across the globe. News provided by Georgian Wine Association.